Yikes it is 0 F or -17.7 C out this morning while I post this! Winter has definitely arrived. We ended up with some snow as well, maybe half an inch to an inch, it blew a lot. My image today is from Minnesota but a much warmer day that was also foggy. 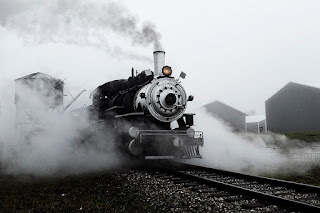 The ex Soo Line 353 was pulling out with one of it's first loads of passengers and the steam from the cylinders in these conditions made for quite the steamy sight.